Even though money is widely used all over the world, that doesn’t mean the concept of managing money properly is understood by everyone. In other words, everyone uses money but not everyone uses it well. Maybe that’s at least in part because we all can tend to view money as a goal and not a means for achieving the goals that matter most to us. That’s where personal finance and wise money management become not just relevant, but important. Personal finance is not always an easy concept to understand and there are many money myths out there. Giving into these financial lies can lead to careless money mistakes and deter you from reaching your financial goals. So eliminating money myths from your personal finance methodology (or your way of making your money work for you) will help you better reach your goals. 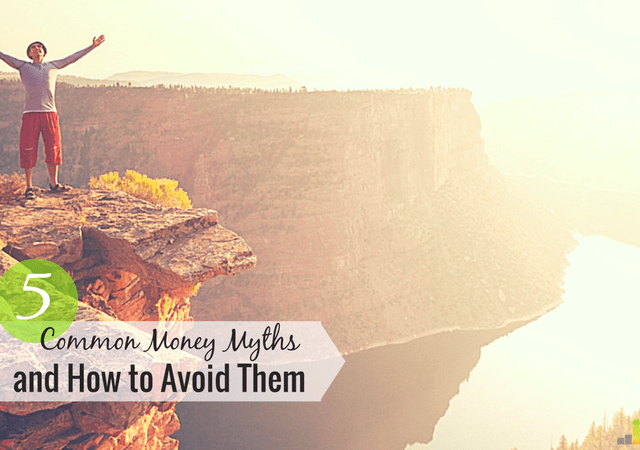 Here are five money myths, some of which I used to believe and some which I narrowly avoided, that almost ruined my finances. Back when I was attending college, I received some financial aid and scholarships, but I still had to take out student loans. I remember speaking with one of my co-workers who I really admired. She had just earned her MBA and was encouraging me to finish up my degree program. Now, anyone who’s poked around on federal student loans websites and read about student loan relief knows that not all student loans are eligible for forgiveness. There are quite a few different forgiveness programs, and strict requirements to meet like working a government-funded job for ten years. While there are student loan forgiveness programs available to certain government workers, teachers and doctors, a journalism graduate like me probably won’t qualify for any programs. Plus, I don’t want to spend the next ten years paying off my student loans anyway. 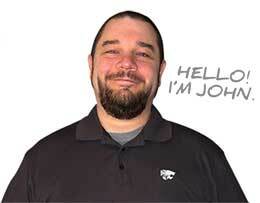 I’m so happy I didn’t listen to my co-worker and carelessly take out extra student loans that I didn’t need. I could have been stuck with payments that I couldn’t afford to make which would have hindered my finances and my credit. This old myth is always circling around. I personally don’t think that brand new cars are more cost effective for everyone, but dealerships definitely try to sell this idea because they want customers to take out loans and spend a long time paying them back so they can make money off the interest. There’s no argument that cars are a depreciating asset. Their value starts to decline the moment you drive off the lot. Whether you purchase an old car or a new car, you’ll still be spending quite a bit of money either on the loan or lease, or on repairs and maintenance. Thankfully, there are more options than just old beaters and brand new cars. What I found that works is finding a balance between the two extremes. When I needed a new car, I purchased a gently used vehicle that was about five years old. It’s wasn’t falling apart and the model wasn’t heavily in demand so I got a nice deal and paid the loan off super quick. Even though the salesman at the dealership tried to lure me in with a brand new car, I’m so happy I didn’t fall for the bait and I don’t have the typical $400 to $500 monthly car loan like many other Americans because I wouldn’t be able to keep my expenses so low. I used to believe the investing lie that you needed to have a lot of money in order to invest or you couldn’t invest while you have debt, but now I know that’s a myth. As I explained when I wrote about a few scary investing statistics, the best time to start investing is now – even if you have debt. You don’t need a ton of money to get started because every little bit counts when it comes to taking advantage of compound interest. Waiting to invest until I’m older would have been a huge mistake since you can’t get any of that lost time back to allow your contributions to grow. For starters, it won’t be too expensive to contribute to your employer-sponsored 401(k) if you have one. If they match your contributions, it’s best to contribute enough to receive that match but even if you can’t afford to, you can still set aside an amount of money that you feel comfortable with for retirement. If you’d like to invest through a brokerage, robo-advisors like Betterment require very little to get started, $0 to be exact, and have low fees. DIYing can save you a lot of money depending on the task, but it can also be time consuming and can even cost you more money than you planned on spending initially in some cases. I’m all for doing it yourself when you have the skills, time and tools to do so. But part of me feels like DIY is a little overrated. Sometimes it’s more helpful to pay someone to do something for you the right way or just do without to save money in the long run. When I was planning my wedding, we were on a strict budget and I envisioned many different aspects that I could DIY with the hope of saving money. Then I got tired and frustrated with the process. When I ran some of the numbers, I realized DIYing certain things would actually cost me more money and more hassle than it was worth. For example, I wanted to have a wishing well box at my wedding so guests could drop off cards and gifts. My mom suggested we make one which would require going to craft and hardware stores to pick up materials and supplies along with a few hours of our time. Meanwhile, at an expo I ended up finding a company that would allow us to rent a wishing well box for only $15. Renting the item instead of making it saved me a ton of time and money because I’m sure the supplies would have ran us way more than $15. Realizing that DIY doesn’t always save money has helped me avoid spending way too much money and time on various different things like a once-in-a-lifetime event like my wedding. This is probably the biggest money myth you should avoid because it can negatively affect your mindset. I’ve settled for less with my finances too many times in the past and it was because I believed it was hard or nearly impossible to earn more money and improve my situation. I stayed with employers who paid me less than I deserved and I used to avoid seeking out new opportunities because people used to tell me I would never earn much as long as I stayed in the writing field. I’m so happy that this myth is very false because there are literally hundreds (if not thousands) of ways to earn extra money and while the biggest challenge is getting started, it’s not hard to boost your income at all once you find an income stream that allows you to do something you like. The best way to avoid falling for money myths is to learn more about personal finance and accept information from a variety of credible sources. Friends and family might try to give you advice and they probably mean well, but you should always cross check any information you hear or receive whether it’s an online source or a face-to-face conversation. Have you ever fallen for any of these money myths? 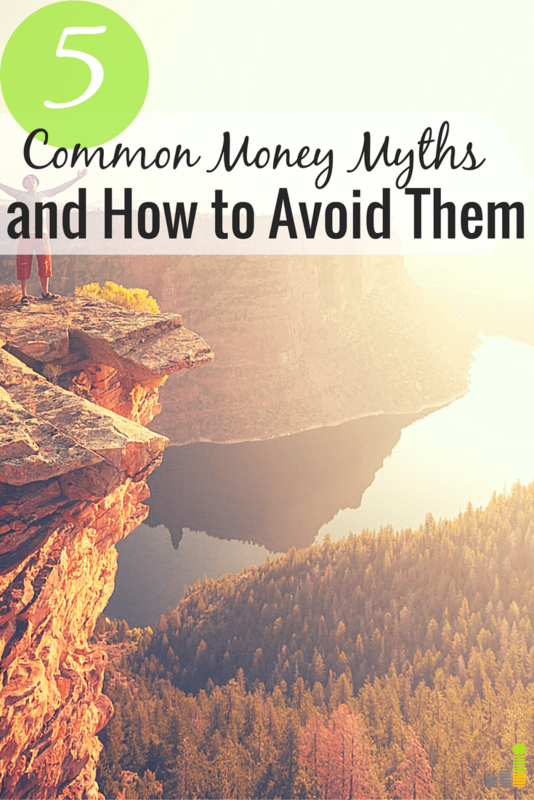 What are some other common money myths you’ve heard or fallen for? What’s one thing you wish you could go back and change – financially speaking? The college myth – yikes! I know parents who aren’t saving for college for this reason. They think college will be “free,” so what’s the point? I highly doubt that! I actually think college is probably going to get more expensive so it’s best for this next generation to understand how student loans work and how to minimize the usage of them before they even enter college. Some ideas are so ‘too good to be true’ that it’s amazing that people believe them. Like the student loan one. Do people think that basically anyone over the age of 35 is student loan debt free? With all the news about loans and such and how they’re weighing people down? That’s very true. When I took out student loans, paying them back was the last thing on my mind. While I did hear about student loan forgiveness, I had no idea what it was or what the qualifications were. Luckily, there was this little thing called Google…. Information is so easy to access these days so people shouldn’t always believe what they hear. Amen to DIYing. It doesn’t always save you money. I feel like this is a secret most crafters know. It will usually cost me as much to make a craft as it does to buy it. In some cases, yes. Since I’m valuing my time much more, I’m very careful with how I approach DIY stuff. Part of being smart about your finances is that you don’t put any option off the table – consider all the options and make the choice that is best for the unique situation. Well said Josh. It’s so important to weigh costs with your time when considering DIY. Sometimes it’s so worth it, and sometimes it isn’t. DIY is such a tough topic! It seems like it should be straightforward but I totally see where you are coming from. 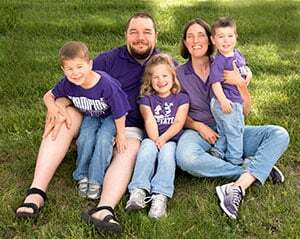 I planned on going the DIY route on our entire house, but since more opportunities have come up with side hustle and my full-time job there has been limited time to do it. I’m not going to lie, it does cost more to outsource but that’s not factoring in time. For those who have a lot of free time I think DIY is a huge win – and a side hustle in and of itself. My father-in-law basically went the DIY route when working on the house my husband grew up in. My in-laws are very frugal, and last time we visited, he was building his own trailer contraption thing outside the house 🙂 He built an entire second floor to their home which is commendable but it’s still not finished yet and the house needs SO much work. He’s retired now so I’m sure he has the time, but they’ve had the house for almost 30 years now and I’d question if all the DIY effort is worth the time when there are people out there who can help get it done faster and easier. I think that’s so true about DIY – but it really does depend. Somethings will definitely save you money if you DIY, but it really does depend what it is and what level of expertise is required to make something! Very true! Those are the key factors. Definitely these are myths. I started investing with a small amount of money. I can attest that you don’t need to have a great amount of money before you invest. There are lots of articles that can help you start investing with a small amount of money. As a huge fan of DIY crafts, it can be really time consuming!! It is true a lot of the crafts can save you some money, but sometimes it is not by a lot! Sometimes it is better to find someone who can make the needed item for you correctly, instead of you buying many tools and parts to make this one craft to only make it decently.